8' x 10' Board & Batten Cottage Series 5/12 Shed with White Pine Board & Batten Siding, 5' Double Doors with Hinges, 7' High Walls, 2 - 18" x 27" Brown Aluminum Windows, Hickory 30-Yr Architectural Shingles. Options included in price: Cedar Stain $329.60, Loft 4'x8' $128.00. Handcrafted in the United States by Expert Amish Woodworkers. 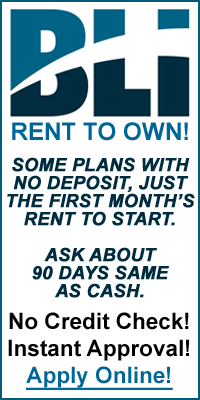 Take this home for only $286.39 with a 36-month rental agreement from BLI Rent To Own. Your initial payment of $286.39 includes a security deposit of 112.61 and your first month's rental payment of $173.78. Ask about 90 days same as cash! Fully assembled and ready for delivery from our Red Hook, NY location. Stock Number C083365. 10' x 12' Board & Batten Cottage Series 5/12 Shed with White Pine Board & Batten Siding, 5' Double Doors with Hinges, 7' High Walls, 2 - 18" x 27" White Aluminum Windows, Pewter Gray 30-Yr Architectural Shingles. Handcrafted in the United States by Expert Amish Woodworkers. Take this home for only $316.17 with a 36-month rental agreement from BLI Rent To Own. Your initial payment of $316.17 includes a security deposit of 124.32 and your first month's rental payment of $191.85. Ask about 90 days same as cash! Fully assembled and ready for delivery from our Red Hook, NY location. Stock Number C103366. 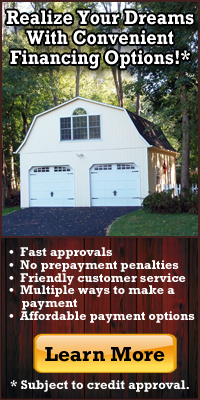 10' x 10' Quaker Style Manor Shed, White Pine Board & Batten Siding, 8' Front & 7' Back Wall, 2 - 28"x24" Tilt-In Wood Sash Windows, 5' Double Doors w/ Heavy Duty Strap Hinges, Pewter Gray 30-Yr Architectural Shingles. Options included in price: 15 Lb Felt Paper $45.00. Handcrafted in the United States by Expert Amish Woodworkers. Take this home for only $341.43 with a 36-month rental agreement from BLI Rent To Own. Your initial payment of $341.43 includes a security deposit of 134.25 and your first month's rental payment of $207.18. Ask about 90 days same as cash! Fully assembled and ready for delivery from our Red Hook, NY location. Stock Number C103375. 10' x 14' Quaker Style Manor Shed, White Pine Board & Batten Siding, 8' Front & 7' Back Wall, 2 - 28"x24" Tilt-In Wood Sash Windows, 5' Double Doors w/ Heavy Duty Strap Hinges, Weatherwood 30-Yr Architectural Shingles. Options included in price: 15 Lb Felt Paper $63.00, NEW 5-YR NO-FADE Stain in Color Caramel 15% upcharge $754.50. Handcrafted in the United States by Expert Amish Woodworkers. Take this home for only $446.14 with a 36-month rental agreement from BLI Rent To Own. Your initial payment of $446.14 includes a security deposit of 175.43 and your first month's rental payment of $270.72. Ask about 90 days same as cash! Fully assembled and ready for delivery from our Red Hook, NY location. Stock Number C103376. 10' x 16' Board & Batten Manor Shed. White Pine Board & Batten Siding, 5' Double Doors w/ Heavy Duty Strap Hinges, 2 - 24" x 28" Wood Sash Tilt-in Windows, Hickory 30-Yr Architectural Shingles. Options included in price: Cedar Stain $511.00 & Felt Paper $72.00. Handcrafted in the United States by Expert Amish Woodworkers. Take this home for only $456.18 with a 36-month rental agreement from BLI Rent To Own. Your initial payment of $456.18 includes a security deposit of 179.37 and your first month's rental payment of $276.81. Ask about 90 days same as cash! Fully assembled and ready for delivery from our Red Hook, NY location. Stock Number C103260.